Mangalore, Sep 15, 2014: A lorry went over the right leg of a 26-year-old motorist after he fell off his vehicle, soon after being hit by a car. The incident occurred near the Surathakal bus stand on Sunday morning. According to Mangalore Traffic North police, Asif (26), a resident of Surathkal, was returning to his house from Panambur on a scooter. Just was he was taking a left turn towards the Surathkal market, a car came and hit his vehicle. 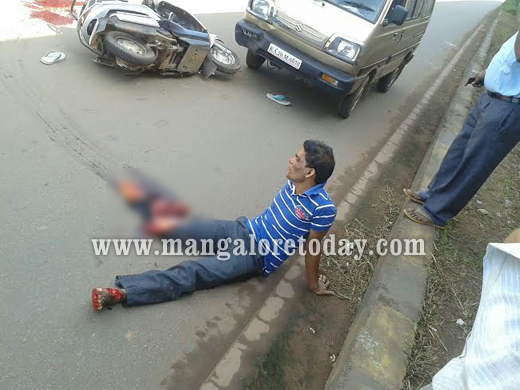 Asif fell off and before he could move off the road , a lorry going towards Udupi went over his right leg. The injured Asif has been admitted to a private hospital in Falnir.